Tom: Do you remember that Folgers jingle? “The best part of waking up…” Well, the answer lies in, “Breakfast Stout in your cup.” Seriously, I’ve had this beer at night, mid-day, after work, but to truly get the full essence of this beer you should enjoy it on a Saturday morning with a hearty breakfast. If you think 7:30AM is too early to be drinking an 8.3% beer then you need to man/woman up. 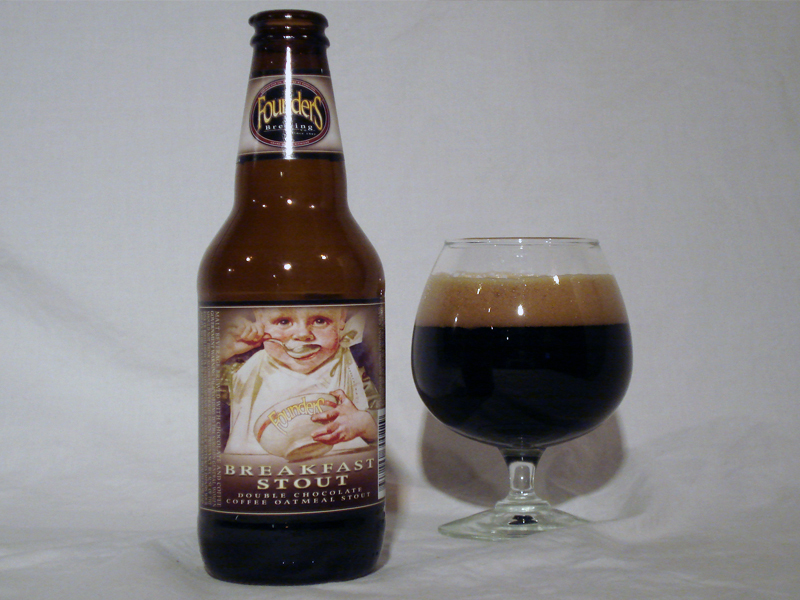 The beer serves as the base for Founders KBS and CBS beers which are aged in various Bourbon barrels. Brewed with Sumatra and Kona coffee, and imported bitter chocolates this beer has some extra added muscle. I really enjoyed there Imperial Stout so the addition of oatmeal alone give Breakfast Stout a velvety, silky, slick mouthfeel. Not to mention the aroma smells like a bag of oats in a barn. I let you in on a little secret. Please do not pour or enjoy this beer right out of the fridge. You need to let this reach cellar temp (55-60 degrees) for maximum enjoyment and aroma. This is for a few reasons. 1) the head on this beer adds to the overall presentation and I’ve noticed that many video reviews lack the head that I feel should rightly be there. 2) the colder temps limit the aroma and flavor of the chocolate and coffee. So, if you want to get the most out of this beer…drink it warm(er). I bought my bottle and let it sit on my basement floor for 8 hrs before opening. The aroma is…bitter chocolate and deep coffee notes. What else could I expect? It had a great black coffee, espresso quality at some points. The astringent bitterness form both ingredients lifted the other to new heights. The dark bitter chocolate notes seemed to rides the coat tails of the coffee flavors. However, other wafts seemed to suggest the opposite. I guess you can say all three aspects (chocolate, coffee, and oatmeal) worked harmoniously to provide a very appealing aroma. The taste broke down about the same. I’ll be honest, the mouthfeel just about made this beer. Breakfast Stout possessed the right amount of thickness which gave it that meaty, chewy, and creamy quality. The flavors clung to my palate and I didn’t mind. Coffee breath…you’ve smelled it on your co-workers. Now add luxurious chocolate and oatmeal to that and you’ve got yourself the backbone. Coffee up front and on the finish. Smooth, yet bitter in its own right. The chocolate was fresh and reminded me of making chocolate chip cookies with my mother as a youngster. I’ve always known Founders Brewing Co. were a world class outfit, but this beer blew me away. I’ve waited a long time to get my hands on the Breakfast stout and it didn’t disappoint!! It screams class from its look, thickness, aroma, and flavor to the label on the bottle. Simply stunning and while I have yet to try KBS or CBS, this is for now the best stout I’ve ever had. Period. Deep, deep coffee flavors from the moment you crack the lid. You know immediately that this is no session beer. The mouthfeel is creamy, yes, but not outrageously sticky like I was expecting from the intense black color and smooth, thick pour. It sticks around long enough to make itself known, then melts away. The coffee flavor isn’t something simple…like, “oh yeah I can sure taste the coffee!” Instead, you ask yourself what beans they used for it, and wonder if you can get some for your morning joe. The grain is far from burnt, like you might remember from your first Guinness. When they say “toasted” they mean it – think level 3 on a toaster, spread with some butter and sugar. Drink 2 or 3, slowly, before deciding what you think. There is certainly some chocolate in there, too. It adds a kind of unique bitterness to the hops (60 IBU overall). It’s just discernable over the coffee and sweet creaminess that defines this beer. This was my first from Founders. Right now, I’m sipping on their Centennial IPA and loving it just as much. (Review soon, please?). It’s quickly becoming the brewery I trust 100% of the time to deliver. I don’t like Michigan, as a whole. But Founders is changing my mind. Overall: Try this beer. Please! Even if you don’t like coffee, this is the archetype of what a stout should be. Undoubtedly my favorite stout and top 5 beers overall. I am new to stouts/porters in general and so far the brand I have come to trust is Founders, they continue to amaze me. Actually porters and stouts are the first beers i could ever drink. The breakfast stout reminds me of a nice breakfast on a cold morning. Dark and rich coffee with slightly burned toast, and oatmeal to top it all off.